It’s a busy week here. We are juggling several things including the blog, the weather, lots of commitments and our own series of Market Giveaways but we did want to take time to join in the fun of the Blogger’s Quilt Festival over at Amy’s Creative Side. Mom and I have been blogging about this quilt for a long time and and now we can finally say it is finished. The pattern is from American Patchwork and Quilting’s June 2010 issue. The quilt is called Odds and Ends. It is the cover quilt. You might not recognize it right away as it is the cover quilt and there it is shown with a tan sashing. Mom is working on her quilt of the same pattern. I pieced it…Mom quilted it with a Baptist Fan. The Baptist Fan are free motion. If you want to see how to do them, check out this link. I tried getting a close up of the quilting, but the thread blends so nicely I couldn’t get a clear picture. By this time, Puppy was getting a bit tired I think. Today, we are hooking up with……Confessions of a Fabric Addict, Link a Finish Friday, Freedom Fridays and Crazy Mom Quilts. You’ll want to remember to check out our Spring Quilt Market giveaways with a new giveaway going on each day: Friday, Saturday and Sunday. 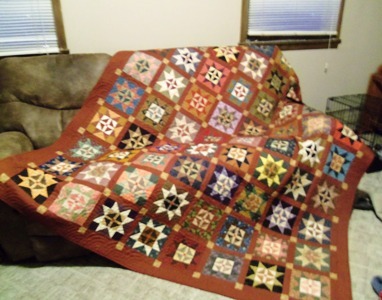 This entry was posted in Fellow Bloggers, Finished Projects, Quilting on May 17, 2013 by Jo. That is beautiful! OK, Puppy Cat is cute, too. 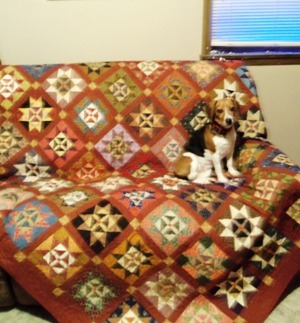 Star quilts are so classic ‘hearth & home’ aren’t they – and comfy too! Oh my gosh, I love it. It is beautiful. Puppy probably couldnt help herself because it looks so comfy. beautiful quilt!! 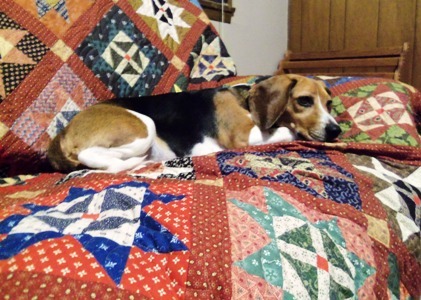 I have that one on my long list of “Gotta Make” quilts– love your version of it- nothing better than scrappy! It’s beautiful – and looks like a lot of work and love went into it. I love this quilt….from the warm, scrappy colors to the block design. Cute puppy too! Star quilts are always pleasing to the eye. Very nice. Such a great quilt! It just looks so warm and lovely. You are so patient with all of those stars. My very first quilt project was a queen size quilt of all traditional stars. I got it all cut out…and…well, it is still cut and on my shelves. Someday, down the road, maybe I’ll actually finish the first quilt I ever started with. In the meantime, I’ll enjoy your’s. Congrats on a beautiful job!